It's about damn time! After years and years of nominations, Jon Hamm finally won an Emmy for Leading Actor in a Drama for his role as Don Draper in Mad Men. The actor is a perennial nominee and loser of this award for season after season of the AMC series, but he was finally awarded the honor he's deserved for so long. (If only the Emmys could have given other perennial nominee Amy Poehler her due, too!) Hamm seemed to have a mix of disbelief and relief when his name was called for the award and of course, he had his natural blend of charisma and humor when going up onstage to accept his award by climbing onto the stage without the help of the steps. The best part of the win was his speech, which was sweet, gracious, funny, and just plain joyous, as Hamm made clear that he was so happy to have worked with such amazing people on Mad Men. He could not include enough thank yous, which extended beyond his Mad Men family to those in his personal life. He even seemed to thank Jennifer Westfeldt, with whom he recently separated after 18 years together. It was a sweet inclusion, as despite their romantic situation, Westfeldt was with Hamm throughout his run on Mad Men. 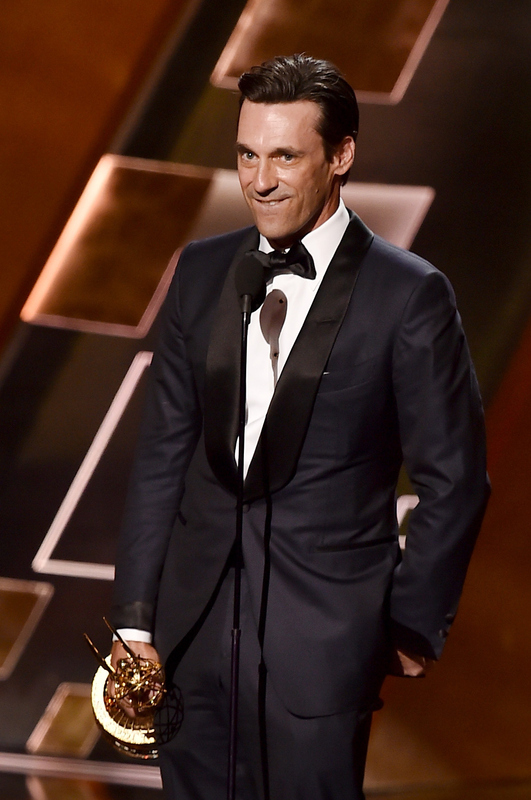 But more importantly, hearing Hamm's speech reminded viewers why he seems just so damn lovable and charming in real life and why many of us believe he deserved this honor years and years ago. During his speech, Hamm said: "There’s been a terrible mistake, clearly. Thank you for that. This is impossible — it’s impossible to be named with all of those extraordinary gentlemen." It’s impossible to be standing up here. It’s impossible to have done this show with this incredible cast, these incredible people, these incredible writers, our incredible crew. The studio who put this on, Lionsgate, AMC. Am I saying that right?" Continued the actor, "And it’s incredible and impossible for me personally to be standing here so, I want to thank the people to whom I owe an incredible debt, people who in my life have gotten me here, families who have chosen for some reason to take me in and be nice to me along this strange strange road." He finished by thanking those close to him. "So to Bud and Suzie and Maryann and Ted, and Ernie and Carolyn and Vick and Linda, and Gary and Sue, and my sisters and Cora and Jen. thank you all very much. I would not be standing here without you. Thank you to everyone who watched the show. Thank you for this," Hamm said. What a class act. Congrats Jon! It really is about damn time.